Ethiopia has over four million people over the age of 60. Many of these people have no access to a state pension and are unable to save for their old age. If they have no family to support them, their only other option is to live and beg on the streets. We have been working with Destitute Elders Welfare and Development Association (DEWADA) since 1995 to help improve the lives of impoverished elderly people who simply have nowhere else to turn. Providing a basic pension: we provide elderly people with a small pension to help cover the cost of basic requirements, such as food, clothes, and medical bills. Housing maintenance: during our monitoring visits to Ethiopia, we observed that a number of the beneficiaries were living in unbearable conditions. Unstable roofing poses a threat to their lives and poorly built walls mean that people have no privacy nor shelter from the weather. 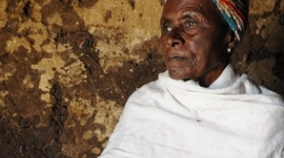 DEWADA has identified 40 of the worst-affected elderly people, and Ethiopiaid is providing additional funding to help cover maintenance costs. Income generating activities: DEWADA encourages the elderly to get involved in activities such as weaving, spinning and small business setup, so that they can generate their own income. Ethiopiaid provides a revolving loan to help kick start any income generating initiatives. In 2016, donors helped us increase the monthly pensions for 1071 elderly people, enabling them to provide at least two meals a day for themselves. Over 240 elderly people have been involved in income generating activities. Ten people who were unable to see because of cataracts have received an extraction procedure and intra-ocular lens implant, restoring their sight. The medical costs for such surgery are £125, including initial assessment, cataract removal, and aftercare costs.